You may already be familiar with the importance of an effective in-store marketing strategy. You also may know the importance of custom point of purchase displays as attractive focal points to grab shoppers’ attention and support sales, add-ons and up-selling opportunities. But what makes a display great? What makes it stellar? While it may be easy to describe why a finished display attracts you to a product or specific piece of merchandise, creating a stellar finished product requires a significant amount of planning, materials sourcing, professional design, and manufacturing. When designed, engineered and produced by the right professionals, the results are both visually stunning and appealing to companies’ bottom lines. But getting to the stellar finished product requires vision and an understanding of the process. There are various elements that go into a custom point of purchase display. You must know where to start in order to develop a desirable finished product that integrates with your retail environment, beautifully displays your product, and creates actionable outcomes from consumers. five best practices for creating a stellar display. As the old adage states, “It all comes down to the bottom line.” The conceptualization, design, and development of a POP display is no different. Have an idea of the investment you are willing to make in your retail environment with a custom point of purchase display. This includes knowing the type of display you are looking for and understanding what is involved in terms of design and manufacturing. For example, does your budget allow for an interactive digital display or are you looking for a semi-permanent display solution to meet seasonal in store marketing initiatives? In either scenario, you must be sure you have a budget that will allow for a creative, eye-catching display that seamlessly integrates with your retail environment and is inbrand. This, of course, includes the appropriate color schemes, branding considerations, and packaging. When the appropriate investments are made in custom POP displays, clients can experience compounding returns. Understanding the financial commitment needed to produce exceptional results is the first and most important step in creating a stellar display. You may enter into discussions with a point of purchase display manufacturer and have a preconceived notion of what you want your display to look like. While a vision is good, experienced POP display designers and manufacturers can offer a wealth of knowledge when it comes to sourcing materials for your display. Keep an open mind and don’t allow preconceived ideas to stifle your final product. For example, your POP manufacturer might recommend a natural item like wood to source for a display to better align with market-savvy consumers and environmentally conscious shoppers. Alternatively, they may recommend a more versatile material like plastic that better aligns to dinnerware or cosmetic displays. Your team of POP experts is just that: experts. Listen to their material recommendations as they relate to cost and aesthetic and be open-minded to their insights. It will only result in a better display. Knowing what you want your display to look like is one thing. Understanding the design and functionality is another. A display must showcase the product’s best attributes and grab consumers’ attention. You need to share your initial vision with your POP team and work with them to create a display that spotlights your product, offering, and value proposition in the best possible way. This means deciding if your in-store marketing program lends itself to a floor or endaisle display, a digital design, or a counter-top display to best showcase your brand and attract consumers. According to sources like the Alliance Center for Global Research and Development, shelf positions and the number of facings are integral to influential retail environments. This needs to be considered when determining how your products are going to be displayed. Design is everywhere and it influences everything. Your POP display needs to become an extension of your retail environment while also claiming its own space to attract and engage consumers. A good point of purchase display company should bring an expertise in both design aesthetic and the engineering of the display. They should be able to tell you what works from a functionality standpoint as well as a marketing viewpoint. You may have your heart set on what you deem to be a “standard” in-store display, but don’t overlook the wealth of knowledge a creative POP professional can bring. From market research, material sourcing, design aesthetic, and functionality, be sure you are open to their creative solutions. More often than not, they will offer design concepts and manufacturing capabilities you did not think about. There is so much that goes into a stellar display. This includes branding and graphic design elements. Much like you call on POP display experts to execute your in-store marketing vision, you should also work with branding and graphic design pros on implementation. Some custom point-of-purchase display companies will offer these services in-house, which is an added bene- fit to you. Depending on the structure of your POP and in-house team, you should always consider product packaging and brand standards from original manufacturers including, but not limited to, already-established logos, font families, and color palettes. 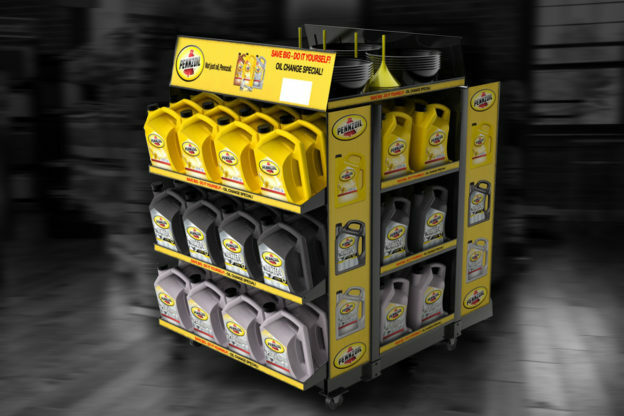 This creates a stand out display that is aligned with a product’s brand voice and image. It also supports cohesive brand marketing on behalf of the product. Take these five best practices into consideration when sourcing your next POP display and enjoy the benefits of a stellar in-store marketing experience.